Many people are very confused these days. They should be. Slowly the nation is coming to grips with a harsh reality that a garden variety recession has not dug its roots inside the body economic of the United States. This is much worse. This is an economic and financial system horribly plagued by insolvency, with vicious cycles causing severe momentum in the damage, where the entire system is facing potential ruin in a disintegration sequence during a virtually unstoppable liquidation process. The key upcoming decision must address the underlying problem of declining property values, and when to institute a national mortgage modification plan. Soon comes the New Resolution Trust Corporation. The Fannie Mae takeover was NOT it! The root of most economic breakdown and banking wreckage is declining real estate prices, whether residential or commercial. Recall that the entire USEconomy and much of the US financial system was not only wedded to the housing bubble, but boasted of its sophistication, clean industry, and offloaded risk. The USGovt will be forced to bite the bullet and put a firm floor on home prices via a New RTC, where the USGovt pays banks on loan balance reductions. Unless and until the New RTC is installed with this broad directive and mission, everything continues to slide into the abyss. A note on the intangibles. The body language visible from financial network anchors tells quite the story, of more humility, some measure of shock, deep concern over the lack of solutions, and growing dismay over the lattice work of corruption. A fine line came from a bright light on CBNC last week, as Rich Santelli from the Chicago pits said “Traders are looking for volatility, so they can make back their entire year.” The networks seem totally incapable of noticing the responsibility of Goldman Sachs and JPMorgan in the destruction, a gigantic blind spot. It is truly remarkable that so much corruption has destroyed the systems underlying the United States, yet observers cannot come to grips with the fact that the corruption is engrained within the most revered firms still in charge. A question is begged: When will US arrogance dwindle? Tough question! Perhaps when foreign support has diminished to the point that the US leaders and population realize that the only path out of the quagmire of insolvency is rampant full-blown inflation and tragic direct dependence on a printing press, in a position of global isolation. In the current environment of systemic breakdown, institutionalized corruption, failed policies, broad ruin, and desperate efforts with unprecedented programs to avoid systemic collapse, the chosen investments must be simpler and outside the system, as in PHYSICAL GOLD & SILVER. Beware of paper gold & silver, which bear little connection to the real thing! Even beware of mining stocks, except for the large caps, which will dominate in lopsided fashion. When the Final Solutions do come, some charred ruin structures will be easily visible from the same corrupt system and institutions. The best outcome will be of powerful price inflation to address insolvency, which will yield yet new ugly problems. Traction has yet to be achieved, by active decision. The Powerz face a risk, that when they want the traction, they must overcome powerful downside momentum in the systemic breakdown. 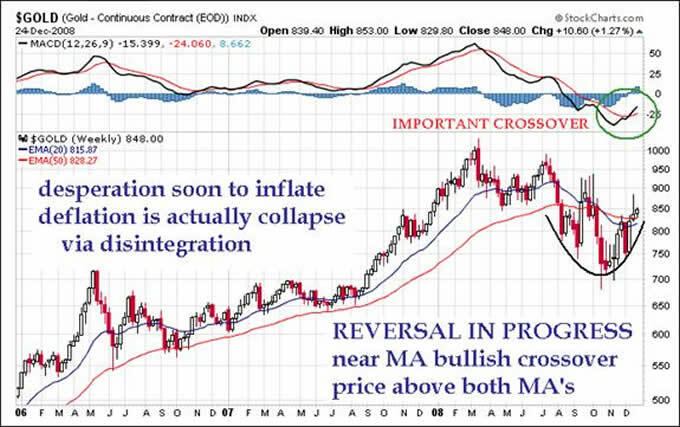 That requires supercharged inflation bound in perverted remedies, which push the gold & silver prices upward, fast upward. The Powerz have waited so long to deliver the alchemists magic potions, that remedy will require much more inflation than the system can handle. The year 2009 by yearend should be marred by very big inflation outbursts in price structures, enough to silence the wrong-footed deflation theory guys. Furthermore, global sentiment is turning against the United States, whose stories of corruption seem to lengthen by the month. Foreign governments, policy makers, and private powerful groups are soon to set into motion their own independent plans, driven by their own self-preservation. Watch Russia and China, hardly allies. Such plans are hidden from view, but discussed in rough terms in the Hat Trick Letter. The effect on the USDollar from domestic home-grown mammoth inflation and foreign maneuvers to isolate the US will be huge and ugly. Not only has the USDollar DX index topped, but the gold price has bottomed. The MACD has a bullish crossover. It foretells of an important cross of the 20-week moving average above the slower moving 50-week MA, a signal never missed by big technical traders. The gold price finally has stabilized a little above both key MAs, laying the firm foundation for large moves up toward 1000 again. The silver price is also in recovery mode, a reversal that has yet to lift it above the key MAs though. Soon, USTreasury auctions will be outright failures. Soon, the majority of rescues, bailouts, nationalizations, and stimulus packages will be financed via the printing press, with all the inglorious rancid effects of systemic inflation in the backwash. To heck with Moral Hazard . Put that label on the locomotive gone over the precipice, and let's put wings on it, so that it can fly and save the USEconomy. Treasury Secy Paulson and USFed Chairman Bernanke have become the Dukes of Hazard . The better analogy is that the USEconomic financial apparatus is like an engine revving at well over 10 thousand RPMs, but the clutch cannot permit any transfer into the gearbox to enable the axel to turn the wheels. Why? Because Wall Street hogs funds at the trough, and because credit creation mechanisms are broken. My opinion all along has been that only when the mortgages are modified with the USGovt paying the entire tab on loan reductions can the system begin to gain traction. Insolvency abounds, and it continues to plague the system in both primary chambers without meaningful deep writedowns paid by the USGovt, the true cost paid by a printing press. More and more stories come to reveal how the housing bubble providing collateral to finance this and that part of the USEconomy, now gone. The story of this year 2008 almost completed is insolvency. The story of next year 2009 will be continued powerful disintegration and desperation to stop it. The missing piece in the great majority of debate and policy for revival of the USEconomy and its banking system is the creation of legitimate jobs and income . Infrastructure jobs would be a great start, provided that pork projects do not dominate the agenda. Already, the nation lacks the huge workforce of arc welders, but does have plenty of loan officers, lawyers, investment bankers and MBAs. Perhaps home construction workers can be quickly retrained as welders. Nowhere has debate and discussion mentioned a primary root cause over the last two decades for the USEconomic disintegration. It is jobs shipped intentionally overseas, like to China & India. The movement started in the 1980 decade, with the Pacific Rim taken and being given the technology factory jobs. Unless and until a substantial portion of lost US manufacturing returns to the United States, all remedies seem hollow, temporary, and mere patchwork, bound in debt-based solutions to a debt cancer. My actual expectation is that the first evidence of returned manufacturing will be linked to the expanded US prison system, not so much for violent and white collar crime, but for the legion of rioters and bankruptcy victims. The pay scale will be pure Third World, intended for subsistence and survival. To begin with, the US so-called ‘Deflation Experience' is not deflation at all. Sure, many investments are losing value fast. Sure, much credit is being burned, with heavy write-downs. But new money is coming into the system from the corrupt bond swaps, historically unprecedented rescues, bailouts, and nationalizations. The $8500 billion in new commitments highlight the inflation side. Also, never confuse the ample supply of crippled assets brought from off balance sheets to actively accounted big bank balance sheets, distorting money supply figures, but just exposing the shell game. The deflation that many analysts describe is actually a systemic liquidation that will be difficult to reverse, a necessary step by producing the critically important inflation. It will come, but with difficulty. The US is not Japan in the 1990s, but something much much worse. The USFed and Dept Treasury, with lackey help from the USCongress, are not pushing on a string. They are rather trying to hold up a man whose skeletal structure is dissolving, while its circulatory system is also dissolving. THIS IS DISINTEGRATION. To argue otherwise seems pure folly and wishful thinking. Many wonder when insolvency becomes bankruptcy for a given company or household. This is a complex question. Start with an easy answer. Insolvency, first of all, means debt obligations are greater than assets held, so that the net worth is negative. When an insolvent entity lacks the flow of funds, its lack of liquidity forces a declared failure or a failure forced by creditors, which is bankruptcy. The sad fact of life for many US companies and households is that their creditors want to be paid back, demand it, and will do what they can to win 30 cents or 60 cents or maybe 80 per dollar owed in repayment. The events of mid-September with failures of Lehman Brothers, of American Intl Group (AIG), and of Fannie Mae had to do with creditors pulling the plug and saying NO MORE. The queer part of the US financial pathogenesis (path of a disease, here being inflation & credit dependence) is that many times the Wall Street firms have been the ones pulling the plug, removing credit lines. In this current era absent altogether of regulatory oversight, combined with the Dept of Treasury run by Wall Street, the various besieged Wall Street firms can and are targeting hedge fund clients whose positions stand in opposition of those at Wall Street firms. One well informed former auditor calls it ‘Financial Genocide' to describe the current actions of those in charge. Back to insolvency. The Wall Street firms are trying desperately to maintain liquidity in order to stave off bankruptcy. They are zombies in search of blood and meat tissue. That is a primary motive for them to confiscate the TARP funds to date, which might backfire on them in the future. No Congressional member will vote yes for any more funds administered by Paulson and his Goldman Sachs henchmen. The Untied States has a unique position when it comes to liquidity. Its banking officials can print money to deal with insolvency and thus prevent bankruptcy. The bankruptcies so far in my view have been more targeted and planned. Bear Stearns was not a team player in the LongTerm Capital Mgmt bailout, and thus was killed with glee. The Lehman Brothers failure was probably more a stress test for the system, with a gigantic basement back window opened for JPMorgan to receive a $138 billion check during the confusion after a pre-dawn meeting on a Saturday with a bankruptcy court judge in Manhattan. The Lehman failure was probably necessary in order to reload JPMorgan, thus permitting it to better handle the vast Credit Default Swap losses, and to reload in the gold suppression game with the oodles of underwater gold contracts. Nevertheless, the US system can benefit from the advantage of turning on the inflation spigot in order to address the liquidity requirements amidst profound broad insolvency. The masters, operating from seats of unspeakable corruption to be sure, have the ability to transfer the problems in progress now into new problems plagued by inflation. That is actually the next challenge, and that is precisely why gold & silver will absolutely thrive as soon as the maestros and wizards decide to attempt to put the Vehicle into First Gear. A great patch of rubber will be laid, complete with screeching sounds and the pungent odor with trail of smoke. The screech will be from savings accounts losing value. The odor will be of amplified inflation entering the room. Added motive to take drastic action comes from the shutdown of major corporations (like car industry), record breaking job loss, reduction in production capacity (from lower end product prices amidst fixed costs), and the idled ports. Dead banks choose not to lend money, period. They are reluctant to lose more, scared to death, burned badly. They are unsure of how insolvent they are, since assets are not even remotely properly valued. Their asset backed bonds and credit portfolios have uncertain value, but certainly far less than is on their books. Bank executives will continue to choose not to lend in this environment, since they know clearly of their insolvent condition. Bank executives will continue to choose not to lend in this environment, since they know clearly of the weak condition for borrowers, harmed by job loss. After all, banks prefer to be repaid on loans, rather than to serve as either stooges in a national cause or sacrificial lambs at a Wall Street barbeque. The big banks to date have cornered over 80% to 90% of the official rescues and bailouts. They have also been invited to engage in a Treasury Yield Curve carry trade, wherein they borrow money cheaply at the rate of short-term maturities, then invest for yields at the long-term maturities. Wall Street has managed to hog the rescue bailout trough, while disseminating false messages about how the US Federal Reserve has enabled broad liquidity programs to assist the people. They are doing precisely the opposite. Over $800 billion has been DRAINED from the private banking system via Cash Mgmt Bills by the USFed in order to feed the Wall Street banks responsible for most of the fraudulent bond packages, for coercion of debt ratings agencies, and for commandeered crony regulatory inaction. Foreign observers are appalled that the US is still run by the same Wall Street conmen, while the US public cannot seem to figure out what to do. The lawsuits against both the USFed and Citigroup will give strong signals on progress against the syndicates in charge, written on billboards. The conclusion reached by the Hat Trick Letter is that the Powerz, the elite in charge, they have no intention of sharing public funds with the common citizenry until they are prepared to launch a national hidden program that has its centerpiece a vast bank consolidation of power. We might be near that day. They have such enormous reserves in store, unused to date, that can be used to purchase undervalued assets, from properties to corporations to commodities. That seems the plan, totally consistent with the serfdom theories that some go further to describe a slave state. The big banks will lead the process. Soon they might turn the switch. That switch will trigger loan grants, a flow of borrowed money, as a green light is issued on credit creation. That switch will be the second decision, however. The first will be the key decision to address the underlying problem of declining property values, with a national mortgage modification plan, the New Resolution Trust Corporation. The credit switch cannot succeed without the grandiose loan modification program in place. The USGovt will be forced to bite the bullet and put a firm floor on home prices via a New RTC, where the USGovt pays banks on loan balance reductions. Unless and until the New RTC is installed with this broad directive and mission, everything continues to slide into the abyss. Insolvency continues without meaningful deep writedowns paid by the USGovt, with the true cost being paid by a printing press. That is how price inflation arrives, in full force, in deadly force. Dead households choose not to spend money, period. They are unsure of how insolvent they are, since assets continue to be valued lower with each passing month. The tragic paths of delinquency, default, foreclosure, and repossession have a profound effect upon spending patterns. In fact, job loss is the primary factor behind foreclosure. Household heads will continue to choose not to spend in this environment, since they know clearly of their insolvent condition. The banks that lend to households are themselves under great duress. Some households might attempt to take advantage of the situation, and run up debts, never planning to repay. Thus the banks are tightening their lines to credit cards. Consumers have it tough. The entire consumer culture in the US was the biggest joke in modern economic history. Finally recognition has come for the plight of home mortgages and loan modifications. The delinquency rate is growing worse each month, not better. Price data on home values is growing worse each month, not rising in a rebound. The weight of inventory and banker desire to unload properties is forcing prices down. The foreclosure rate is growing worse each month, not better. The foreclosure rate in 1Q2008 for home loans under modification was an astounding 53%, a surprise to the financial new lines, but not to Hat Trick Letter readers. It was called a ‘Revolving Door' last spring and summer in reports. As nothing seems fixed, as no remedies seem in place, and as corruption confiscates most rescue funds that are not devoted to subsidize failed firms, the calls become louder for real action . That switch will soon be turned on, to address the underlying problem of declining property values, with a national mortgage modification plan, the New Resolution Trust Corporation. When the USGovt bites the bullet and reimburses banks on loan balance reductions, it will effectively put a firm floor on home prices. Unless and until the New RTC is installed with this broad directive and mission, everything continues to slide into the abyss. The installation of true loan modification of a vast scale, with costs over $2 trillion minimum, and maybe as much as $3 to $4 trillion, will encourage people who are able to purchase homes again en masse. One can debate and discuss and review all the matters on the table. The key point is that the US ‘Situation' can only turn around when housing prices stabilize. However, foreigners will react by selling the USDollar in a very powerful manner. A truly monstrous Vicious Cycle has tightened its grip on the USEconomy, related to housing and mortgage finance. The several vicious cycles have been a regular theme discussed in the Hat Trick Letter for three years. Numerous have been identified and described. The most important feedback loop right now is the absence of capability to finalize home loans and to complete refinanced loans for property. In turn, banks are reluctant to loan while property used as collateral is still stuck in price decline. Bankers also dislike how borrowers have never been so unqualified in a couple generations. House prices suffer from bloated inventory, waves of home foreclosures, and sellers stuck with negative equity forced to foreclose. The jobs picture is rapidly deteriorating, as numerous major corporations deal with staged workforce liquidations. Lending institutions have for at least three months given up on a housing market revival, and thrown in the towel. They sell properties at severe discount. THE ENTIRE HOUSING MARKET IS STUCK IN A VICIOUS FEEDBACK LOOP. Price will continue down, and mortgage bonds will continue to lose value, until an historically significant milestone decision is reluctantly made. It is inevitable, inexorable, and tragic. THE ENTIRE MORTGAGE INDUSTRY, COMPLETE WITH MILLIONS OF HOME MORTGAGES, AND PERHAPS COMMERCIAL MORTGAGES, WILL BE NATIONALIZED WITHIN THE NEXT 12 TO 18 MONTHS. The extreme maneuver will finally put a floor on housing prices and mortgage bonds, but herald the next 30% decline in the USDollar. Logistic challenges will be huge, as will the corruption be huge. The bigger question is whether the new national program is workable, feasible, practical enough to halt the powerful declines with enormous momentum from the liquidation process as debt is cleansed. The Ruling Elite wish to seize as many assets, both property and businesses, at low prices. They will attempt to turn the Reflation Machinery on ‘Fast Go' at some indefinite future date. They are permitting the system to degrade from capital starvation, from bank system drains of capital, and from broad pernicious malacious dictums to banks not to lend to the public. The republic is at risk, since freedom is a luxury totally inconceivable and unavailable to an insolvent nation that badly lacks legitimate income. I wish all happy holidays, whether Christmas is celebrated or not. This is a difficult time, and likely to become worse. Enjoy the important things in life, like family, friends, and activities where pleasure and satisfaction is derived. Sports and movies and exercise have been my diversions all through life. May you position yourself in preparation for continued nasty storms. May you not trust the messages promulgated by the system, intended to deceive, to pacify, and to control. Gold & silver are the strongest investments known to stand the test of time, crisis, and interference. After horrible fires or storms, usually all that remains is the foundation. The current situation is no different. One grand problem facing the USEconomy and the US financial system right now is that its debt foundation is not really a foundation at all, unless you consider bubble wrap as strong as hardwood like mahogany or teakwood. Down here they use rosewood, which is a spectacular Costa Rican hardwood often seen in artwork and nice furniture. The paper-based US wealth was and still is illusory, certain to largely vanish, as the US central bank continues to be overwhelmed and misdirected. Only grandiose mammoth national costly programs to instill unspeakable inflation will succeed in halting the current slide and destruction. Gold & silver will thrive when it occurs, and it will occur as sure as the morning after a storm. At least 30 recently on correct forecasts regarding the bailout parade, numerous nationalization deals such as for Fannie Mae and the grand Mortgage Rescue. Use the above link to subscribe to the paid research reports, which include coverage of several smallcap companies positioned to rise during the ongoing panicky attempt to sustain an unsustainable system burdened by numerous imbalances aggravated by global village forces. An historically unprecedented mess has been created by compromised central bankers and inept economic advisors, whose interference has irreversibly altered and damaged the world financial system, urgently pushed after the removed anchor of money to gold. Analysis features Gold, Crude Oil, USDollar, Treasury bonds, and inter-market dynamics with the US Economy and US Federal Reserve monetary policy. Would you trust a complete estranger with your wife or child??? .......or with your silver or gold?? ?